Not only did I take in the Thames Festival on the weekend, but I also managed to take a look at what was happening in Trafalgar Square. The Jewish festival of Simcha. I have no idea what Simcha is but everyone was having a good time. Interesting photo...she doesn't look like a typical juggler! LOL, I was thinking the exact same thing as Angela! Soooooo, she's going to catch it in her mouth? No, uselaine - she's going to bounce 2 of them from the lenses of her glasses! I am always amazed by the beauty of your photography. You're never to old to learn . Great shot again. 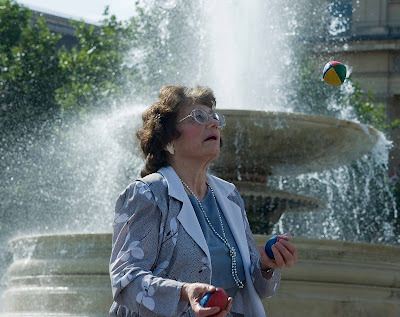 This is a great picture- I would NEVER have thought of juggling in association with this woman! Great capture! That's awesome! I love the backdrop. Those fountains make a good backdrop for practically anything.